The film 30 Days of Night hits Blu Ray disk with a terrifying 1080P transfer that brings out the terror up close and personal. Based on the graphic novel by the same name the film tells the tale of a small Alaskan town that because of its geographic location has 30 days without the sun. The town is soon beset by vampires that are more like the demonic beings of ancient lore, and not the foo foo dressed like a pimp kind of vampire that seemed to dominate Hollywood for so long. For most of the movie it delivers some pretty good horror type scares, especially when the survivors have to deal with a small vampire, It's just mind numbing to hear the little girl say this certain line before she rushes the terrified survivors.. If you have not seen the film, I will not ruin it, but holy crap what a freaky scare. Anyway, the film starts out with the town preparing for its annual "30 days of night," A very long time of no sun during the winter months. Those who do not want to stay in town for the long haul of night are leaving for Fairbanks or other parts. Soon after this is established a very odd character is introduced, sort of a slave to the beings soon to come. This odd ball character seems very much barking mad, perhaps at what he has bore witness to. The character is disturbingly played by Ben Foster who I have seen in a couple of other films and only really started taking notice to. The guy is a real character actor that just brings realness to the characters he plays. Of course we also have the hero of the film, the town of Barrow's Sheriff, Eben Oleson played by Josh Hartnett, who as the town is prepping for the long night to come, has to investigate a string of very strange crimes. Dozens of cell phones are stolen and destroyed, a helicopter is sabotaged and several sled dogs are stabbed to death. Eben's Ex -wife is thrown into the mix, Stella (Eben's Ex) is played by Melissa George. She is sort of the fire marshal in the area and was in town to make sure the local fire station had its equipment up to spec. She of course misses the last plane out of town and is stuck there. 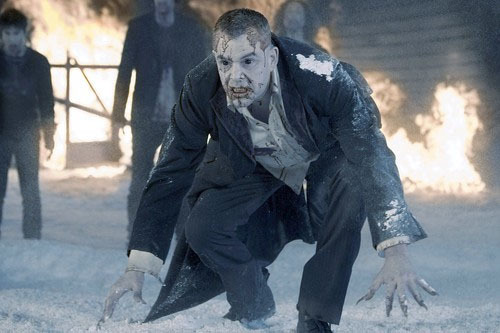 Soon after this, the Vampires attack, this pack of animalistic creatures are led by one mean looking vampire played suitably un-nerving by Danny Huston. The rest of the film in a nut shell as they say is spent by the survivors trying to survive till the sun comes back. Really good horror film with some driven performances, pretty impressive cinematography, one of my favorites was a sort of flying over head shot that goes over the town as the Vampires are attacking in full frenzy and the chaos it shows as the towns people are pretty much food for the beasts. The film is what it is, a popcorn horror film. It doesn't really trip over itself until the unoriginal ending, with such cool scares and out and out spine tingling events, I expected more from the ending, not a lame attempt at a tug at the heart strings. So ok, that's the movie, now how does it compare on Blu Ray Disc? The detail is impressive; even some close up shots that showed ever so slight blurs did not take away from the look of this high def presentation. Blacks keep their inkiness and don't give into muddy grays like a couple of other Blu Ray films I've seen have done, and the splashes of red blood on the stark white snow are hauntingly beautiful to behold. Sony did really well with this Blu Ray offering all around. Audio for 30 Days of Night Blu Ray is darn spectacular. Pumping out in surround sound speakers the viewer is engulfed in the middle of the film and may feel things up close and personal, from gun fire, and to the spine tingling shrieks of the Vampires as they attack! Sound is one of those subtle senses that some may not even think about. For entertainment such as movies and games it's just another tool to provoke an emotional response. In some cases in 30 Days of Night, that response may be primeval, because you almost have that feeling of run for your life when the Vampires give off that shrill cry. So too does the music score lend itself well to the film, when you almost do not even notice the score, the folks who put the film together did it very well. Thankfully Sony followed through with some special features, which perhaps would give the fan of the film a bit more appreciation in the films creation. Behind the scenes looks with the cast, the crew, casting, and the stunt work are all here. As part time actors ourselves, Shael and I appreciated seeing some of the work put in for the actors playing the vampires. How do they move? How do they attack? All really cool stuff, especially if you're a fan of the acting craft and what it takes to bring it to stage or screen. Keep up the good work Sony! 30 Days of Night, an impressive addition in Blu Ray Disc, well worth to have in your collection. Have fun, play games. and enjoy a film!